Presented by Andrew Marr, this programme marked the first time in many years that the BBC had broadcast a play live from the theatre in which it was being performed. At the performance, Zoë represented her late father, Sam Wanamaker, who spearheaded the reconstruction of Shakespeare's Globe Theatre. Zoe was invited to speak about her father's vision for the theatre and also gave her thoughts on the all-male production of Richard II, alongside actor Colin Redgrave, during the interval. Andrew Marr: The original Globe was built in 1599, using wood dragged from an earlier theatre across the River [Thames]. It became arguably the most important theatre in the history of mankind, thanks to William Shakespeare (one of its speculative owners), many of whose greatest plays were performed here. Forty years on, politics intervened: Parliament, under the Puritans, decreed that all London's theatres should be closed, and the great Globe was torn down. It took three-and-a-half-centuries for the rebuilding to start, after Sam Wanamaker, an American, arrived in London and was appalled to find no permanent Shakespeare theatre here. It took more than thirty years after that to realise his dream, and he died before the new Globe was finished. But his vision was triumphant. The theatre re-opened for business in 1996 and it has been playing to packed houses ever since. 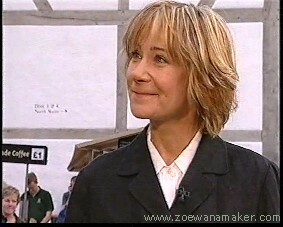 And I'm joined now by the splendid actress Zoë Wanamaker, daughter of Sam. Zoë, first of all, what brought your father to London shortly after the War? Zoë Wanamaker: He was making a film here called Christ in Concrete or... I can't remember the other title of it! And he came looking to see if he could find Shakespeare's Globe, and all he found was a plaque on a brewery wall. AM: So he was wandering around, could find nothing else, and he was shocked. Now, this became a kind of lifelong obsession, an exercise in tenacity. Why do you think that was? ZW: I have no idea. I just think he loved Shakespeare and I think when he was young, as a student at university, when he was studying - he first studied Law - he did a Shakespeare season at one of these festivals in America, and they did a Shakespeare play every two or four... every two to four hours. AM: Extraordinary audacity for a young American student. Doesn't know London, doesn't know Britain, arrives here and thinks, 'Well, there should be a Shakespeare theatre. I'll make sure there is one!' And, you know, ere there is, but it was a very long struggle, wasn't it? ZW: Yes, it took twenty-six to twenty-seven years of energy and time to try and convince people that this was a good idea. AM: Now, very sadly, as we know, he died before it opened. Do you think he'd have been pleased with the productions that we've seen in the years since? ZW: Oh, I think so. I think the thing is about the space is that it's experimental; nobody's actually worked on it in this century before and so it's a fresh, young thing. AM: There's nothing like it anywhere else - certainly [not] in London, probably [not] in the world. AM: And it took an American to bring it here. AM: Of course, of course. AM: Zoe, one of the things that strikes me, listening to the play again, watching the play again, is the patriotic undertones all the way through, the sense that the earth of England is almost alive that you get. And I was very moved by Mowbray, again, being sent into exile, unable to speak English. When Shakespeare was writing this, he had no idea that English was going to be a global language, did he? This was a small country, hemmed in by much larger languages; and if you were sent out, you were really voiceless. AM: And it is terribly close to people. I mean, we're sitting up here in the gallery, watching the audience watching the actors, from time to time. It is like watching Wimbledon, almost. They're moving like that [i.e. moving their heads from side to side]; you can see the whole audience moving like that. It's very, very close. ZW: It's also... it's also the concentration of an audience which is wonderfully exciting to see. It's the really... the silence that you have and also the appreciation, because people are really listening. People are leaning over, which is wonderful, and people standing. It's exhausting to stand for this length of time, without moving about. 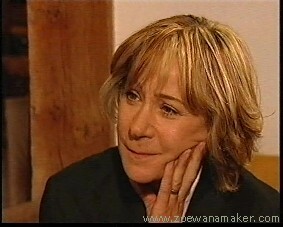 AM: Zoë Wanamaker, we'd been talking earlier on about the politics of this play. What was it that brought your father to this country in the first place as a young man? Politics, I think. AM: And he was a man of the Left? AM: And had to come to Britain. ZW: Yes, extremely. And, because of McCarthyism, he was in danger of being... well, he was blacklisted, and that's why he came to this country in the first place - and, ironically enough, interestingly enough, worked with Corin's father - directed him. AM: Really? Directed your father? That's fantastic. Not in Richard II, I see. No, no. AM: The ban's been lifted. You're allowed! CR: I'm allowed, yes, yes, yes. [Laughs] I'm allowed, yes. But that was one of the things that, I think, brought them together. They fell out, for mysterious reasons which we'd been trying to work out earlier on, but that's sort of secondary. I think that was one of the things that brought them together. That and the fact that my dad was very interested in what Sam brought to this country in the way of immensely vigorous theatre from the work that he'd done in America, which must've made a lot of what was done in England at that time look very pale and rather insipid. And he brought a terrific vitality to all this. AM: I hadn't realised this connection. AM: Of immersing yourself... doing things... all the exercises and so on. ZW: Yes, the Lee Strasberg Method. AM: Oh, I see. I didn't realise that. AM: Zoë, we are in the presence, I think, of an extraordinary and very, very beautiful production here, and this is the 'living' Globe, this is what your father wanted. ZW: I think so, very much so, very much so. He was a visionary - and derided.